This camping hammock tent can be easily made by modifying a simple tent. Sleeping off the ground puts you away from the ground critters and insects. It will also keep you dryer than a regular tent in case of rain. No more worrying about the tent bottom getting wet. And you can make it yourself in just a few steps. 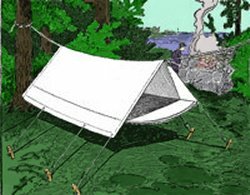 The features of the camping hammock tent shown in the illustration are compactness in transportation and general serviceableness. It is made by sewing a piece of canvas to the sides of an ordinary "dog" or shelter tent and may be made of a piece of canvas or tarpaulin. The tent is suspended by the ridge from a heavy rope supported on trees or posts. It is kept taut on the sides by tent ropes attached to stakes driven in the ground. This form of tent is particularly convenient in providing a good sleeping place in very small space. It is free from dampness, and the camper is provided with a comfortable rest free from prowling animals, without the use of a cot. If you have read The Hunger Games, you know the value of sleeping in a hammock off the ground!